Leah Levi, a first-grade Judaic studies teacher at The Moriah School in Englewood, is one of 47 winners nationwide of the prestigious Grinspoon-Steinhardt Awards for Excellence in Jewish Education. Levi is the only recipient from Bergen, Hudson, or Passaic counties, and one of only three from New Jersey. The award recognizes early childhood- through 12th-grade teachers across North America for their commitment to Jewish education. According to the Jewish Education Service of North America, which distributes the awards with the Harold Grinspoon Foundation and Steinhardt Foundation for Jewish Life, honorees must demonstrate exceptional achievement and serve as role models in Jewish education; have a minimum of three years experience; teach at least six hours a week in a Jewish day school or other formal Jewish educational setting; and nominees must be either an early childhood educator or teach day school or congregational school in kindergarten through 12th grade. Levi, a Teaneck resident, received her bachelor’s degree in religious education from Stern College, but she wanted to work part time after graduation so she could spend more time with her new and growing family. 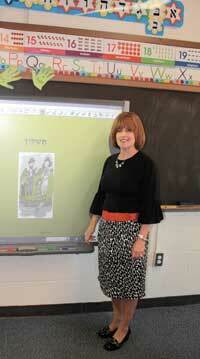 Levi began her career teaching third grade part time at the JCC of Paramus’ Hebrew school for six years. As her children grew older, she began work at Moriah, where she recently began her 27th year. While in Paramus she also taught adults to read Hebrew, and she has taught second and fourth grade at Moriah. First grade, however, has given her the most satisfaction, she said. Technology has had a major impact on the classroom experience, and Levi has tried to stay ahead of the curve by using cutting-edge Smart Boards and Powerpoint presentations in her teaching. After attending a Smart Board workshop, Levi used the technology to create Voki, an animated smiley face that speaks Hebrew to the children. The children were very excited by the character, Levi said, and do not even realize she provides the character’s voice. The Smart Board also allows Levi to give her children what she calls multi-sensory learning through interactive Powerpoint presentations. For example, when a student taps on the word “tekiah” on the Smart Board, the computer will make the sound. Students can learn much better when they use all of their senses, Levi said. She will have the children write letters in sand, or look for visual clues to help their reading skills. Moriah administrators nominated Levi for the award earlier this year. Calls to Moriah’s administration were not returned by press time. The Grinspoon Foundation first handed out the teaching award in 2000 and the Steinhardt Foundation for Jewish Life joined the program in 2002. For more information, visit www.jesna.org.